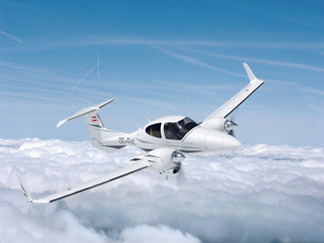 The DA42 Twin Star was certified in Europe in 2004 and in the United States in 2005. The airplane is made of carbon composite material. It is equipped with a Garmin G1000 glass cockpit. The DA42 Twin Star was the first diesel-powered fixed-wing aircraft to make a non-stop crossing of the North Atlantic, in 12.5 hours, with an average fuel consumption of 21.73 litres (4.78 imp gal; 5.74 US gal) per hour (10.86 litres (2.39 imp gal; 2.87 US gal) per hour per engine). In June 2010 a DA42 powered by Austro AE300 engines became the first aircraft to be publicly flown on algae-derived jet fuel.